The first time I discovered drinking chocolate was in Portland at the beloved Cacao many years ago. It was shortly after having finished Chocolate Lab in pastry school, so I had a fresh perspective on the world of chocolate. I thought it the most luxurious elixer one could ever have. Smooth, velvety… completely indulgent. Like drinking a chocolate bar. Since my discovery, I’ve been making hot chocolate at home using various bar chocolate, always dark and at least 72%. Sometimes I make adult hot chocolate by spiking it, other times enjoyed simply with or without inclusions such as ginger, cardamom, or chilis. Orange is probably my favorite, after dinner as a dessert with a bit of booze, of course. Those packets of cocoa powder with copious amounts of sugar and tiny marshmallows; hot cocoa – my childhood dreams. They are a thing of the past. Hot chocolate (aka drinking chocolate) and hot cocoa are not one in the same, however. Hot cocoa is made with cocoa powder where the cocoa butter has been removed. Alone, cocoa powder has an intense chocolate taste, and no fat. Hot chocolate on the other hand, is made with chocolate; bar, baking or chips. 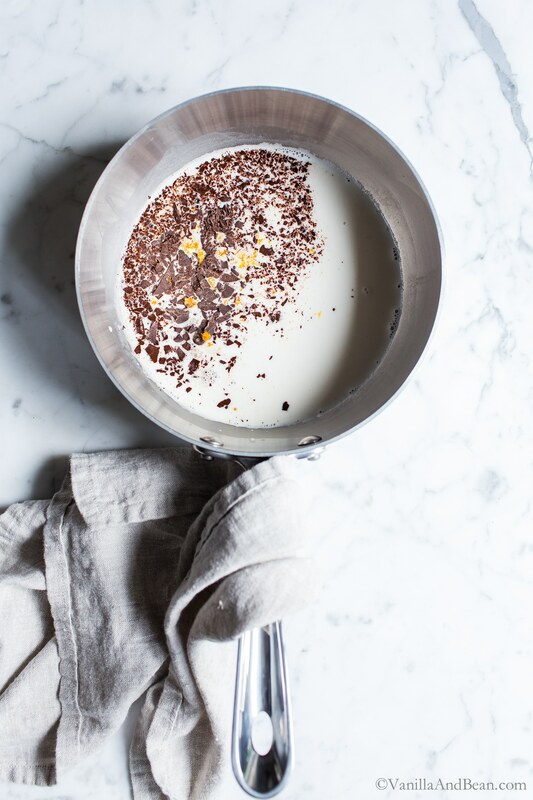 It’s the cocoa butter (fat), in part, that makes hot chocolate completely luxurious. Want to take this adult hot chocolate over the top? 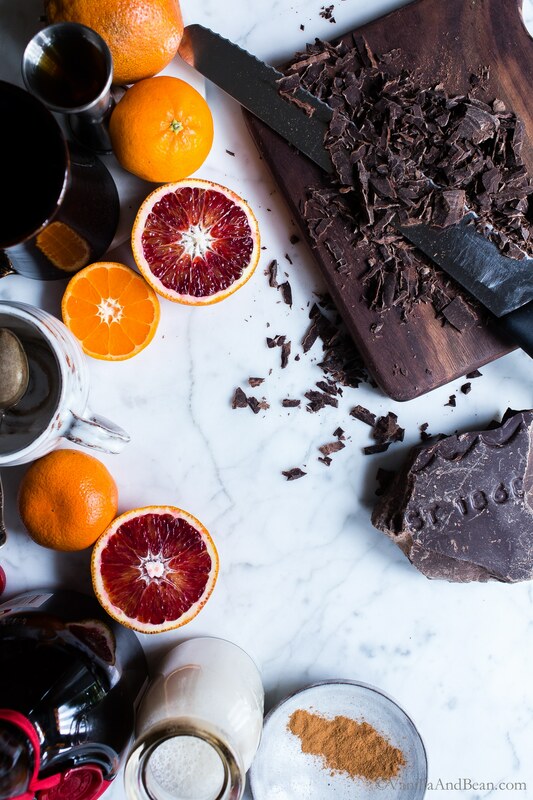 Since I consider Spiked Orange Hot Chocolate a dessert, I look for high quality chocolate; the higher the percent chocolate, the less sugar it contains and the more bittersweet it will taste. I go for dark, anywhere between 72%-80% and look for chocolate that is organic, and fair trade. 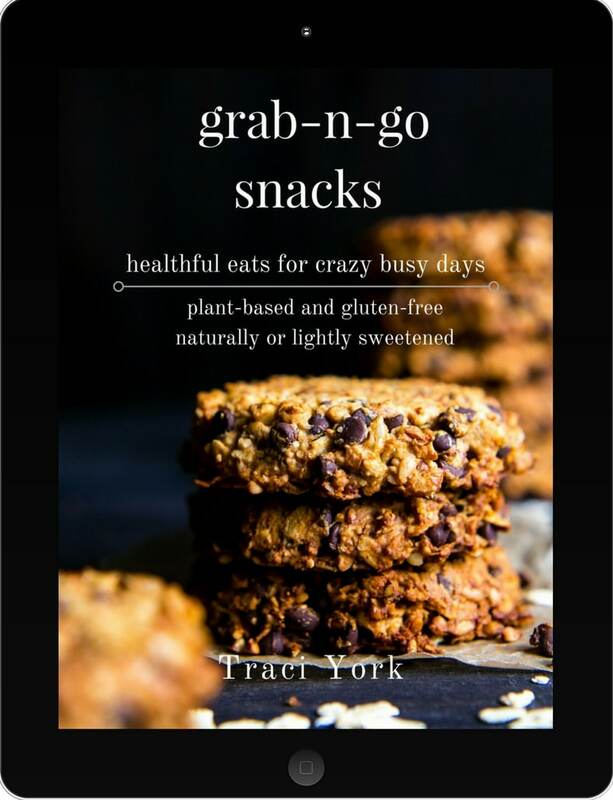 Completely adaptable for vegetarian and vegan diets. 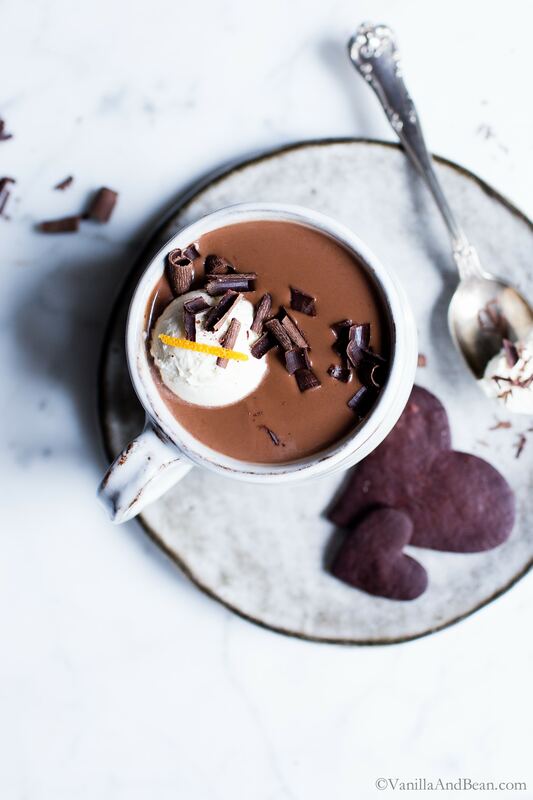 For a luxurious dairy free hot chocolate dessert experience, and to treat your Valentine, go for unsweetened homemade cashew milk, or full fat coconut milk. Whole milk, or 1/2 n 1/2 (or a mix of whole and 1/2) can be used as well. 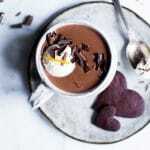 Top this adult hot chocolate sipper sweetened whip cream or coconut cream or simply with shaved chocolate. Hot chocolate is rich enough on its own. Use your favorite high quality chocolate. If you’re a fan of bitter notes, go for a high percent, over 72%. It pairs beautifully with orange zest. 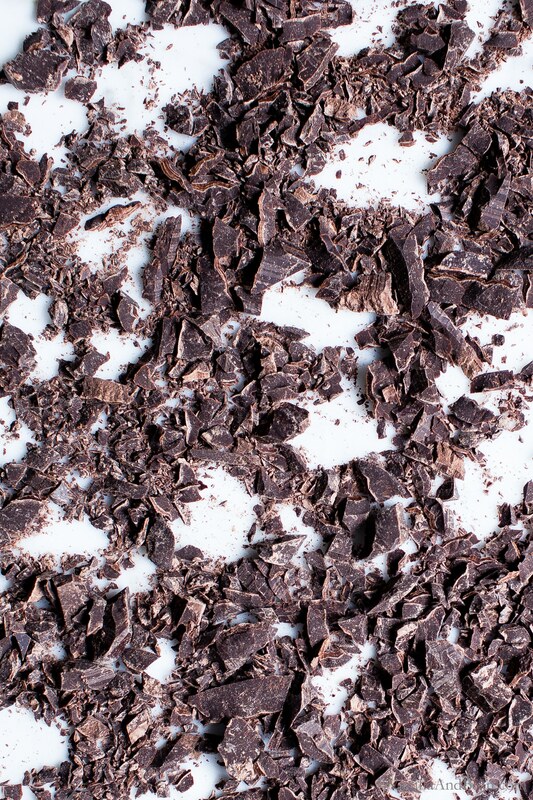 Look for dark chocolate in bulk bins too – the price is better and it reduces waste! I like Theo’s Pure 70% dark chocolate. This resource lists many excellent (and vegan) chocolate brands. Not sweet enough? Add a 1/2 tsp at a time of maple syrup or brown sugar – add to taste. This recipe is easily made alcohol free too… simply leave it out and add just a bit more milk. For Valentine’s or other special occasions, share with Dark Chocolate Shortbread or Vegan Chocolate Shortbread. In a medium sauce pot, add the milk, chopped chocolate, zest, salt and cinnamon. Gently heat on the lowest setting, whisking occasionally until all the chocolate is melted. About 5 minutes. Do not allow the mixture to come to a simmer or boil. Remove from heat and gently whisk in the Grand Marnier. Strain into a serving cup(s). 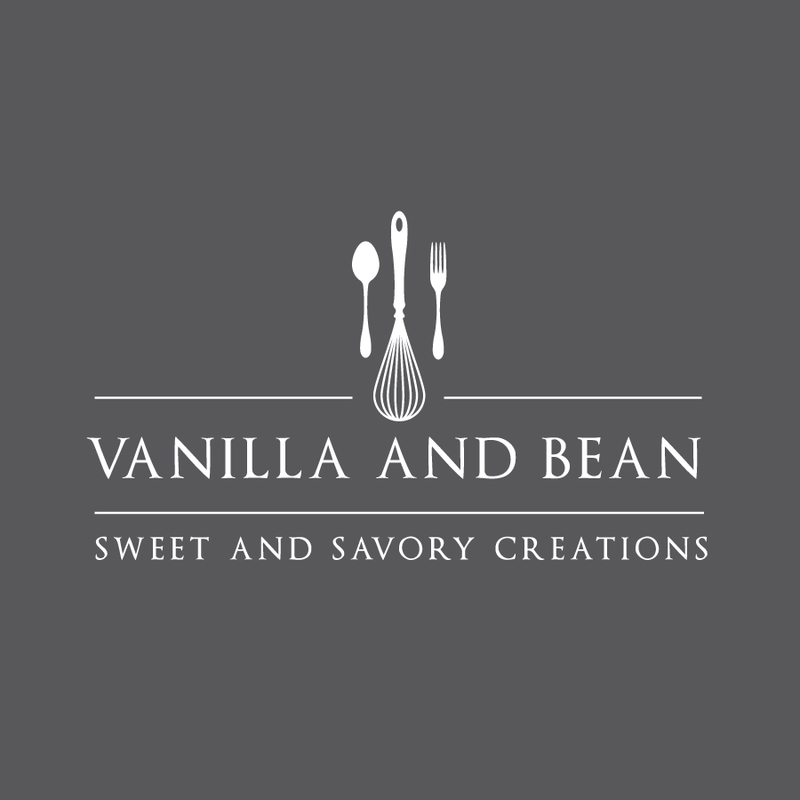 Garnish with optional whipped cream or coconut cream and shaved chocolate. About the Recipe: since milk selection and kitchen equipment on hand varies, here are some easily adaptable recommendations. I use full strength, unsweetened homemade cashew milk or full fat coconut milk, depending on what I have on hand. I occasionally use dairy too. If using dairy, try whole milk or if you're feeling really indulgent, 1/2 n 1/2 or a combination of the two. The Topping: a scoop of lightly sweetened whipped cream or whipped coconut milk can be used for the topping. However, this recipe is rich enough all on it's own. Forgo the additional fat on top and it will still be an indulgence! *This resource lists many vegan chocolate brands. Find what's at your market and use it! Green & Black's, Theo, Endangered Species, are excellent. that fact that you said a glug of Grand Marnier makes me love you more! I need this to stay warm and cozy. Will you deliver? Beautiful my friend! I absolutely love how the orange shines in this simple sipper! It’s smooth and so satisfying and completely indulgent! Thank you Linds! P.s. I hope you had a beautiful Valentine’s Day! Those dang allergies! I hope Boy enjoys it… and I know you enjoy simply the process of making it for him. ;D. Yall have fun this weekend, my dear! Thank you for your pin! So so dreamy my friend. Every picture is so gorgeous, and the flavor combo is bomb my dear. Love the orange in it and chocolate is so good. So luxurious and I am dreaming of have this right now. This looks so tasty, Traci. Love that you’re using real chocolate and yes, please, to the Grand Marnier! While we’ve been having a really mild winter in Los Angeles, it does get down into the low 50s so I’d love a cup of this in the evening. Pinning! This sounds like the dreamiest hot chocolate EVER Traci! You know I’m totally loving the little bit of booze in my cup! The perfect winter warm up right here, and oh so perfect for me and my Valentine! Oh my goodness, I’m so into this! 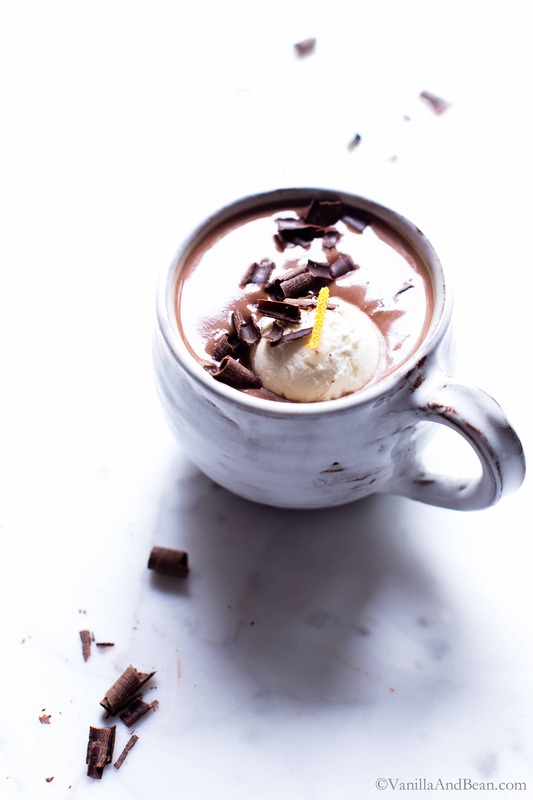 I hardly ever take the time to make ‘real’ hot chocolate, so I need to try this right now! Oh what a treat and to go full on with the flavor combination I can see pairing this with one of your blood orange and chocolate chunk scones! Oh my word, Jean! I didn’t even think of it…. a perfect, and over the top indulgent, pairing with those Blood Orange & Chocolate Chunk Scones! OMGeeee!! I can’t believe I’ve never had spiked hot chocolate. This looks like a treat the hubs would flip over. Blood oranges are my new obsession! “Real” hot chocolate is such a treat. So luxurious and the flavor is amazing! No more packets! 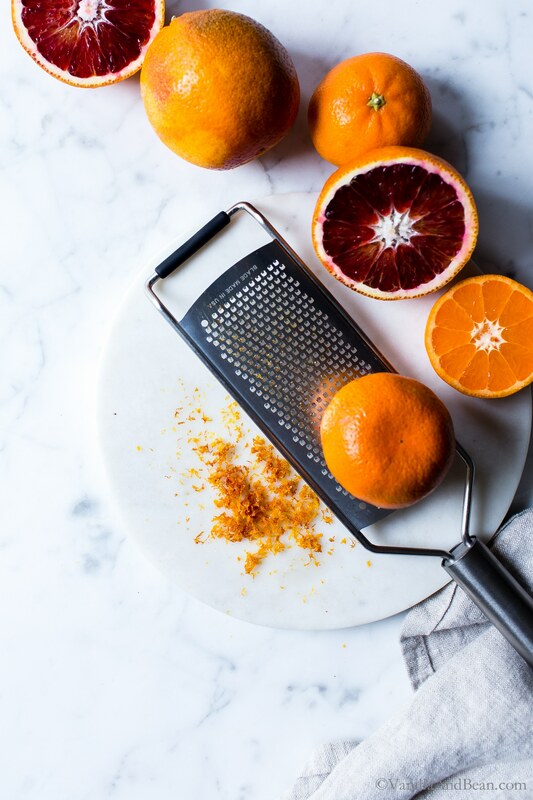 Love the addition of blood oranges…and of course, a little booze! Happy *almost* Valentine’s Day, Traci!